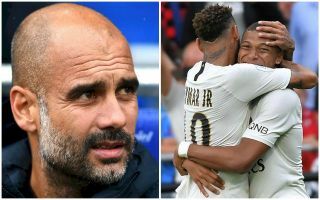 Manchester City manager Pep Guardiola reportedly wants a superstar transfer for his club – and has identified Neymar as the man to be his answer to Lionel Messi or Cristiano Ronaldo. According to Don Balon, the Premier League giants could be ready to pay big to get this deal through, by offering around £87million and Gabriel Jesus to Paris Saint-Germain. This would be a pretty sensational deal, and while offloading Jesus might not be too popular as he looks such an exciting young talent, it would surely be worth it to bring in a player of Neymar’s calibre. City strolled to the Premier League title last season and would be near-unstoppable if they had the Brazil international leading their attack. Things haven’t quite gone as expected for Neymar at PSG, with the club’s dominance in Ligue 1 a bit of a given, but the lack of progress in the Champions League a bit of a worry. Neymar to Manchester City transfer on the cards? The 26-year-old will have surely expected more after leaving Barcelona last season, and may well now feel that linking up with Guardiola at City to play in the best league in the world would be the best way to move his career forward. And for City, having that kind of marquee signing in their squad in the mould of Messi or Ronaldo could be that final touch needed to turn them into a force in the Champions League.